April 11, 2011 - Through the generosity of two donors, MAF (Mission Aviation Fellowship), a faith-based, nonprofit ministry that brings aid and assistance to needy people in remote places around the world, will soon take delivery of a pair of new KODIAK airplanes. The Quest Kodiak is a high-wing, un-pressurized, turboprop-powered fixed-tricycle-gear aircraft built by Quest Aircraft‎ and suitable for humanitarian applications in unimproved areas. A skydiving version has been certificated. The Kodiak bears a strong resemblance to the Cessna Caravan, but it is significantly smaller and lighter than the Cessna, intended more for the utilitarian market, although an executive interior, the "Summit package" with club seating, is planned for introduction in the near future. Last year an anonymous donor provided a $1.7 million grant to purchase a KODIAK, with the condition that another donor commit to a grant in the same amount. Just recently a second anonymous donor stepped forward with the funds for the second new plane. "We are grateful for this generous gift that empowers MAF to further assist people in remote areas of the world that are largely inaccessible without MAF air service," said John Boyd, MAF president and CEO. "We greatly appreciate our partnerships with donors who have come alongside us to increase our services to people living in hard-to-access areas of the globe." 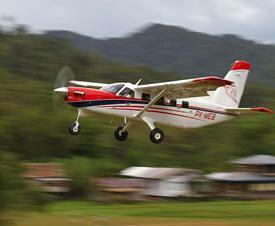 Most planes in MAF's fleet are Cessna 206s that run on avgas, a costly fuel that is difficult to obtain in remote areas. KODIAKs, however, run on more readily available jet fuel while using the same short, rough airstrips, thus solving the fuel problem. KODIAK airplanes are far more cost-effective to operate and enhance MAF's ability to quickly transport essential aid where it is most needed. More than a decade ago MAF launched a multi-year initiative to replace many of its aging Cessna 206s with new KODIAKs. Designed by Quest Aircraft Co., with input from MAF and other relief organizations, the KODIAK carries a larger payload than its predecessor. The six KODIAKs MAF received since 2009 have been deployed to Papua and Kalimantan, Indonesia, and Central Asia. MAF's first deployment of a KODIAK for disaster relief was following the devastating 2010 earthquake in Haiti. The new planes will be deployed to Papua.